Quite often, I get criticised in the ‘Comments’ section of this blog for being “too positive”. I’m accused of being sycophantic to the manager and blind to the club’s problem. Those readers will probably enjoy this blog a little more. Equally, I hope that those fans who enjoy my more positive outlook will forgive the sombre mood of this post – but I was deeply alarmed by what I witnessed today. When Arsenal took to the field at St. James’ Park a week ago, our first XI looked decent enough. It was the bench that bothered me. One week, and a few predictable injuries later, those substitutes have been promoted and are getting game-time. Their inexperience and insufficiency was exploited ruthlessly as Liverpool recorded their first victory away to Arsenal of Arsene’s reign. A watershed result in a watershed month for the manager. I’m not blaming the kids. The likes of Jenkinson, Frimpong, Ramsey and Miquel tried their very best. Unfortunately, however, they made rookie errors which, at this level, simply don’t go unpunished. The truth is that they oughtn’t have been out there today – it is not their fault that the squad has been stripped of experience. In the first half we were performing well enough without creating any chances of note, until we lost Laurent Koscielny to a back injury. That setback saw Miquel introduced, and a nervy Arsenal never really found their footing again. Watching in the stands, the match had a 0-0 draw written all over it – Liverpool were seemingly happy to park their five man midfield and take a valuable point. The game hinged on the sending off of Emmanuel Frimpong. Along with the outstanding Thomas Vermaelen, Frimpong had been Arsenal’s best player, but after clattering Lucas Frimpong picked up a second booking and had to go. Over-enthusiasm and a rush of adrenaline put an end to what was otherwise an outstanding full debut – the FA should be doing everything they can to convince him to change his mind and play for England. Liverpool, smelling blood, introduced Luis Suarez, who set about tormenting our backline with his speed and movement. The goals Liverpool got were admittedly graced with luck: both appeared to be offside, and one was the result of a calamitous own goal after Miquel’s clearance hit Ramsey and looped over the advancing Szczesny. But with ten men and a defence of Sagna at left-back, Jenkinson at right-back, and Vermaelen and Miquel in the middle we were asking for trouble. For the first time I found myself wondering with concern just where Sebastien Squillaci was. Miquel did alright, and can obviously pass a ball, but was understandably nervy. He wasn’t alone in putting in a less than inspiring performance: Sagna looked uncomfortable at left-back, Jenkinson was committed but struggled on the ball, Ramsey was erratic, Walcott anonymous, and Arshavin awful. But, at the moment, they’re all we have. The knocks and suspensions we’re picking up are unfortunate. But we know we have a squad prone to injury and discipline, and have taken no steps to counter that. 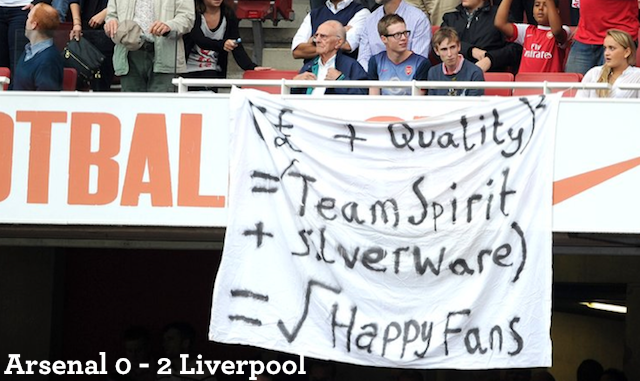 When Liverpool went ahead, a good number of fans chanted aggressively, imploring Arsene to spend some money. I didn’t join in – at that point, the team were still very much in the game and needed our support. I did, however, entirely understand the sentiment. Liverpool weren’t brilliant today, but their team looked an awful lot better than it did twelve months ago – and this, let’s remember, was without Gerrard and with Suarez starting on the bench. It’s no coincidence that since January, they’ve spent about £100m. Yes, they’ve overpaid for some players, but they’ve got the personnel they needed. And they’re better for it. There is a lot to be learnt from their handling of the Fernando Torres sale. Torres was a symbolic and pivotal figure at Anfield – much like Cesc was at Arsenal. After selling him to Chelsea, they immediately replaced him with players able to come in and make an immediate impact in their first team. Crucially, it also gave the entire club a lift, and convinced players and supporters alike that they would recover from the transfer. I’m not advocating anything as absurd as paying £35m for Andy Caroll, but some new additions would not only plug the gaping holes in the squad, but also give the whole club a boost. Those holes will widen further if Samir Nasri leaves next week. The headline news was that he started the game, and I thought he did OK. During the match a story broke on French TV station Canal Plus that the deal with Manchester City may have fallen through – I have to say I doubt that very much indeed. Arsene Wenger said he knew nothing about it after the game, but City officials are privately briefing journalists that they’re confident a move will go ahead. Wednesday will act as a deadline of sorts – if he plays against Udinese, he would be cup-tied for the Champions League (IF Arsenal qualify). Right, let’s get this straight: Samir Nasri doesn’t love this club. Or, if he does, it’s a love which comes second to monetary gain, which is no kind of love I know. The fans in that stadium today love the club. Unlike Nasri, they’re putting their money in to the club rather than taking it out. And unlike Nasri, they’ll be here next week. And next season. And beyond. I didn’t join those who left early, or who booed. But I understand why they’re frustrated. For the first time, I have serious doubts about our ability to qualify for the Champions League both for this season and next. I hope, with all my heart, that I’m proved wrong. 1-0 to the Arsenal. A familiar scoreline, but a far from familiar Arsenal performance. For much of the tie – indeed, the entirety of the second half – Udinese bossed possession, and Arsenal were to forced to look for counter-attacks as they tried to grasp a foothold in the match. Fortunately, we were protecting a lead, thanks to a goal in the fourth minute from Theo Walcott. The English winger met Aaron Ramsey’s cross with a lovely cushioned volley which, at close range, gave Handanovic no chance. Arsenal had started fast and it looked at one stage as if we might blow a shell-shocked Udinese away. However, led by the slippery front-man Di Natale, the Italians recovered well to secure a foothold in the game, and only the fabulous save from Wojciech Szczesny, a brave block from Alex Song, and the width of the crossbar prevented them from grabbing a first-half equaliser and crucial away goal. If Arsenal were relieved to see half-time, they couldn’t have known what travails would follow. In the first nine minutes of the half, they lost Kieran Gibbs and his replacement, Johan Djourou, to hamstring injuries. With Armand Traore also out, it meant having to hand a first-team debut to Carl Jenkinson in an unfamiliar left-back role. The lad did OK, but had he made a major error I would’ve felt incredibly sorry for him: he shouldn’t never have been in that position. Six months ago he was playing in the conference; now we’re expecting him to be ready for the Champions League. It is, frankly, ridiculous. You could say the same of the introduction of Emmanuel Frimpong, though the tenacious Ghanaian midfielder seems to be taking to first-team football like a duck to the proverbial water. Even so, the fact he gave away several dangerous free-kicks is indicative of his inexperience. Our squad is thinner than Steve Bould’s hair. Joey Barton has more depth. On the bench yesterday Andrey Arshavin represented the only plausible attacking option. Wantaway Nicklas Bendtner was included to make up the numbers; if he wasn’t brought on for the struggling Chamakh he was never going to be used. Nevertheless, we held on for what, in this sort of tie, is a good result. We could even have nicked another: only a stunning save from Handanovic prevented Walcott from adding second late on after Gervinho finally rounded off his promising approach play with an effective final pass. A draw or even a 2-1 defeat in Italy will be enough to take us through. It’s great to record another clean sheet, and I thought the triangle of Szczesny, Vermaelen and Koscielny were impressive again, whilst in midfield Aaron Ramsey showed tremendous work ethic and desire. The problem of our ever-depleting squad, however, remains. Yesterday, Emmanuel Eboue and Carlos Vela became the latest players to leave Arsenal, joining Fabregas, Clichy, Denilson, and Emmanuel-Thomas. More are set to follow. The steady drain of talent is becoming an exodus. After the game Arsene Wenger declined to speak to the press, ostensibly as part of a stand-off with UEFA, who were unhappy that messages were being passed to pitchside via Boro Primorac and Colin Lewin. He will have been relieved to have found an excuse to avoid the outstretched cameras and microphones. Doubtless he would have faced more questions about strengthening his squad – questions to which, as yet, he has provided few answers. There remains much work to do: both in the second leg in Udine, and in the transfer market. Get busy, Arsene. In some respects, this game was much like the equivalent fixture last season. Arsenal dominated the first half, fell away in the second, and had a French-speaking black man sent off for a spat with Joey Barton. Missing were two key ingredients: a stomach-turning, apocalyptic sense of despair; and goals. A 0-0 is quite an unusual thing for an Arsenal team, and suggests two things. 1) We were surprisingly assured at the back – 2) we were surprisingly lacklustre in attack. The team was as I expected, with Laurent Koscielny and Andrey Arshavin picked ahead of Johan Djourou and Theo Walcott. From our existing crop of centre-backs, Koscielny and Vermaelen is clearly Arsene’s preferred pairing. Walcott, meanwhile, is only just returning from injury, and with Cesc and Nasri both absent the manager was always likely to plump for Arshavin’s craft. In the first half we dominated without actually creating too many clear-cut opportunities. Tomas Rosicky had a good opportunity early on but, having gone 34 league games without a goal, never looked convincing. Gervinho was lively, exhibiting some direct dribbling and elusive moment, but all too often his final ball was inaccurate. The closest we came was through Laurent Koscielny, who beat a hesitant Tim Krul to Rosicky’s corner, only to see his header cleared off the line. Newcastle barely threatened, and when they did Wojciech Szczesny was in dominant form, showing great confidence to come off his line and punch the ball away whenever the opposition put a threatening ball in to the box. Newcastle’s 4-4-2 formation meant they constantly found themselves outnumbered, so at half-time Alan Pardew introduced Gabriel Obertan, who played from a little deeper than Demba Ba. Newcastle improved, particularly defensively – it would’ve been impossible for them to play much worse – and as a spectacle the game dropped off. The second half will live longer in the memory, however, because it was punctuated by two very unsavoury incidents. It will not surprise you to know that Joey Barton was involved in both. First off, he lunged in to an untidy tackle on Alex Song. It wasn’t particularly pleasant, but it didn’t warrant what followed, as Song maliciously stamped down on Barton’s unguarded ankle. It was an incredibly stupid thing to do. For one thing, Song was already walking a tight-rope having been booked. As it is, the fact that the referee missed it means he’s likely to be pulled before the FA and handed a three-match ban for violent conduct, missing games against Liverpool and United in the process. With Jack Wilshere also a doubt due to an achilles injury, that’s the last thing we need. The incident clearly riled Barton, who stormed off the pitch to ask why the fourth official hadn’t communicated what had happened to the referee. God knows what he’d have done if the fourth official had answered honestly: the batteries on his walky-talky had run out. With fifteen minutes to go came the game’s second major talking point. Gervinho, who had switched flanks throughout the contest, darted down the left in to the penalty area, and skipped inside Cheikh Tiote. As he did so, he went to ground. The first question is: was it a dive? Match of the Day’s Alan Shearer, who is as quick as any pundit to throw out the ‘Johnny Foreigner’ cliches, felt it wasn’t, and I’m inclined to agree. Whilst Gervinho undoubtedly left his foot in and went to ground easily, there was contact. The referee didn’t blow for a penalty, but nor did he go to give Gervinho a yellow card for simulation. In fact, he turned his back on the incident, and waved play on. And this is when Barton saw fit to get involved. Charging up to Gervinho, he dragged the Ivorian to his feet, and in the resulting melee Gervinho reached a hand out and slapped Barton on the side of the head. The debutant was sent off, and Barton booked. It was reminiscent, of course, of last season, when Abou Diaby was dismissed for reacting to a horrible tackle from Barton. 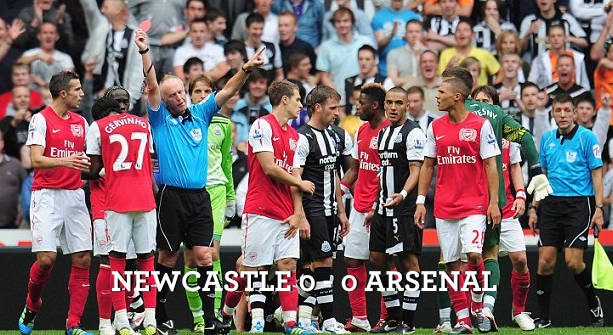 There’s no doubt in my mind that Barton was out to get an Arsenal player sent off as ‘revenge’ for the Song incident. Barton is the type of player who gets involved purely to induce that sort of outcome – it’s not coincidence that these incidents follow him around. Pundits will sometimes call these players ‘great wind-up merchants’ – Wise, Savage, Bellamy – everyone else calls them horrible little shits. The way he reacted to Gervinho’s tap on the face, falling to the ground as if he’d been shot, with Steven Taylor (who has a history of that kind of thing himself) miming an elbowing motion was rather embarrassing. After the game Alan Pardew defended Barton’s attack on Gervinho by saying “no professional likes to see diving”. But it’s OK to writhe around on the floor after being caught by what is essentially a pat on the head? Gervinho was, I hasten to add, no angel. He didn’t make much contact with Barton’s head, but that was largely because he was off-balance. Let’s be honest: he wasn’t reaching out for a tender stroke, or to gently replace the preposterous fringe Barton was sporting. I can understand why Song and Gervinho reacted the way they did to Barton’s provocation, but I’m still disappointed. It’s no excuse to say, “he started it”. Barton is a twisted individual whose consuming anger has forced him to seek medical and psychological treatment. He is someone whose consistently aggressive behaviour makes it difficult for him to exist peacefully in wider society. He is no barometer by which we should judge our own players. Part of their responsibility, as professionals, is not to respond to idiots like him. I think Arsene called it right when he said post-game that the referee should have given Gervinho and Barton equal punishments. There is nothing in the rules that says that “raising your hands” is an automatic sending off. The definition of violent conduct is employing “excessive force or brutality against an opponent”. I’m not sure either Gervinho or Barton were guilty of that, and if anyone was excessively forceful it was certainly Barton. Amusingly enough, what Barton did to Gervinho should probably have resulted in a spot-kick being rewarded anyway, as play had continued. The frustrating thing is that the referee didn’t actually see what took place, but having booked Barton there is no chance of him being punished retrospectively. I expect Gervinho’s ban to be upheld, and for him to be joined in a three-game sin bin by Alex Song. After that brief drama the game petered out. Arsene brought on Johan Djourou and debutant Emmanuel Frimpong to shore things up, and despite a couple of late chances to release sub Theo Walcott, the match ended in a 0-0. And so, we kick off our campaign with a draw, which I probably would’ve taken before the game. Credit must go to our defence, who coped well with an admittedly tame Newcastle attack. I thought the back four of Gibbs, Vermaelen, Koscielny and Sagna looked composed throughout, and it was particularly great to see the Belgian back, even embarking on a couple of trademark marauding runs up the field. Further up the field, however, we lacked precision in our passing in and around the box. As Arsene might put it, we “lacked a little sharpness”. Despite dominating possession, we barely created a single clear-cut chance from open play. Of the outfield players, only Djourou, Walcott and Chamakh have any kind of Premier League experience, and with Chamakh looking out-of-sorts a rusty Walcott was the only real option. When you consider that there was only one player excluded because of injury – Jack Wilshere – the squad begins to look incredibly thin. The suspensions for Gervinho and most likely Song are only going to make that situation worse. If Eboue, Nasri, Fabregas and Bendtner really do depart, as seems certain, then Arsene simply has to bring in at least three players to replace them. Anything less will leave us with a squad that is, in my opinion, unlikely to qualify for the Champions League. Watching us on the pitch yesterday suddenly brought home the significance of losing Cesc and Nasri all the more clear to me. These are huge, huge players. Aaron Ramsey is a talented and characterful kid, but he’s not even close to their level. Replacements are necessary if we’re to achieve our minimum aim of a top four finish, let alone challenge for major honours. Anyway. There will be time to talk about that. For now, we have to concentrate on preparing for Udinese on Tuesday – by which time, our coffers could be significantly swollen.